Protesters gathered downtown to express their opposition to federal funding for a border wall. A group of local activists gathered outside the Federal building on this Christmas Eve to voice their displeasure about President Trump’s proposed border wall and the partial government shutdown. Members of the CNY Solidarity Coalition and the Syracuse Peace Council want their elected Senators and Congress-members to know where they stand. The group held signs. 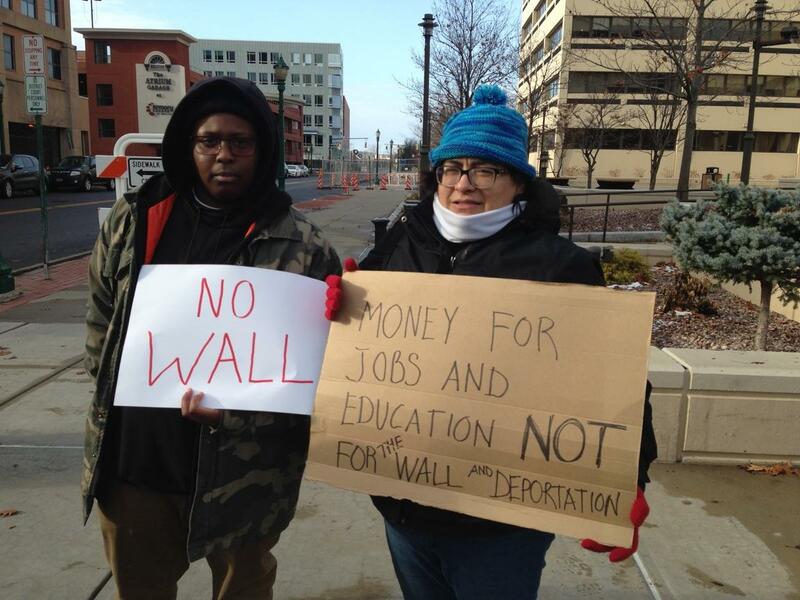 One read, “Money for jobs and education; NOT for the wall and deportation." The CNY Solidarity Coalition’s Peter McCarthy hopes their messages will be heard and taken to Washington. He predicts that if a border wall was built, it wouldn’t stop the flow of immigrants fleeing from Mexico and Latin American countries that have problems he blames on the U.S. Syracuse Peace Council member Gavin Landless says the U-S would be going against a pathway that immigrants are entitled to seek. Landless adds that he feels a border wall would not enhance border security or amount to any real benefit for the American people. A Syracuse woman has traveled more than 2,700 miles to the southern border near Tijuana to support the Central Americans seeking asylum in the United States. The Trump administration is sending 15,000 troops to the border in an effort to stop the so-called “caravan” from entering the US. WAER News caught up with Sheila Sicilia via a shaky phone line, and she says the migrants are fleeing dictators and violence that have been perpetuated by decades of flawed US policy. Over 300 protesters met outside of the Embassy Suites near Destiny USA Tuesday to decry the arrival of Vice President Mike Pence. He stopped in Syracuse for a $1,000 per plate fundraiser for the reelection campaign of Republican Congressman John Katko. Tom Drumm is a protest organizer and member of Speak Out CNY. He says the protestors represented an array of organizations and causes, but all feel that Katko and his colleagues need to do more to rein in the Trump administration.